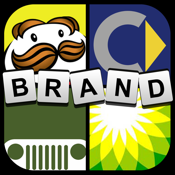 ***** From the creators of the apps "Guess Movie", "Guess Where It Is"
You think you know all of brands? Try out "Guess Brand"? Each picture has been handcrafted to denote a brand. And you can view all guessed brand pictures in "Gallery" and save them to your album. * No registration, no complicated rules. Just start playing and have fun! * Includes over 350 quests of brand. Guess them all!